My sisters and I have been making this recipe for years. It tastes like a snickers candy bar. 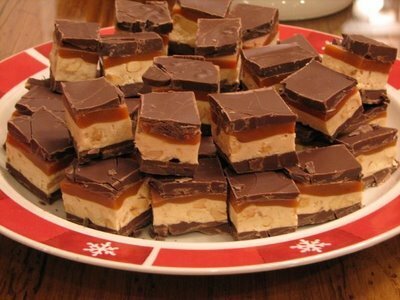 If you like snickers you will like this recipe. I like to try new candy recipes each year, but this is one of the few recipes that I make year after year. The few years that I have not made it, I have had people ask me where it is. So, I now make it every year. This recipe has several steps. It takes some time to let each layer set up, but it is not hard to make. I usually cut these into small squares so that it will serve a lot. This is also a recipe that can be make quite a bit ahead of time. I have had this in the fridge for up to a week and it does just fine. Line a 13-in. x 9-in. pan with foil; butter the foil with 2 teaspoons butter and set aside. In a small saucepan, combine the milk chocolate chips, butterscotch chips and peanut butter; stir over low heat until melted and smooth. Spread into prepared pan. Refrigerate until set. For filling, in a small heavy saucepan, melt butter over medium heat. Add sugar and milk; bring to a gentle boil. Reduce heat to medium-low; boil and stir for 5 minutes. Remove from the heat; stir in the marshmallow creme, peanut butter and vanilla. Add peanuts. Spread over first layer. Refrigerate until set. For caramel layer, in a small heavy saucepan, combine the caramels and cream; stir over low heat until melted and smooth. Cook and stir 4 minutes longer. Spread over the filling. Refrigerate until set. For icing, in another saucepan, combine chips and peanut butter; stir over low heat until melted and smooth. Pour over the caramel layer. Refrigerate for at least 4 hours or overnight. Remove from the refrigerator 20 minutes before cutting. Remove from pan and cut into 1-in. squares. Store in an airtight container. Yield: about 8 dozen. This sounds and looks so good! I’m not a big peanut fan, althouh I love peanut butter–I wonder how it would do with chopped pecans? I just may have to try this one next week when I start my holiday cooking. Charlene, I have always used peanuts so let me know if you try it with pecans. I would be curious to know how it turns out. That looks soooooooo gooooood! It’s barely 9am and I can’t wait for my after-dinner dessert! I’m not a huge fan of butterscotch. Could I use a substitute chip? If it’s essential, do you taste the butterscotch? Trish, it is a slight butterscotch taste but not much. However if you do not like butterscotch just use more regular choc. I think it will be fine. I just found my “MUST TRY” candy recipe for 2008! YUMMMMM! That sounds sooooo good! I will have to try that one! I can see why everyone asks for this, each year! Wonderful. Thanks for sharing. Don’t forget about the TMTT giveaway, next week. I don’t want you to miss out. Thank you! By the way, I love your blog! I love coming across homemade candy recipes like this one! They always come in handy around the holidays :). I’d like to include your adapted recipe on our blog, please let me know if you’re interested! I will try this for my next meeting i have for moms in my area. Do you have a recipe for “Buckeyes” or Peanut butter balls? they are delicious and I lost my recipe! My husband LOVES the snicker bar type candy and I cant wait to make this for him. Thanks! I have tried making these twice in the past few days and I seem to be having a major problem with them that I cannot seem to fix. My Nougat layer will not set up. I let it completely set up in the fridge, for a long time… and when we go to cut them… that layer just runs all over the place in a big liquidy gooey yucky mess! I’m wondering if I’m not cooking long enough, or possibly cooking too long. I’m also wondering if I need more marshmallow creme. I just measured out 1 1/2 cups, but do you go by the ounces on the actual jar? Any help you could give the candy making challenged mommy would be fabulous! Thanks! @Heather, Heather, I have never had that problem. But I am guessing it has to do with the cooking time. I set a timer for 5 minutes as soon as it comes to a boil. With candy making you have to be pretty precise on the times. So, if you are not setting a timer, I would be sure to. I usually measure out the marshmallow creme but if it looks to thin after adding 1 1/2 cups, I don’t think it would hurt to add more to help it set up better. I hope that helps. I love these bars, so I am sorry you are having trouble. This is one of my favorites! They taste as good as they look 🙂 I haven’t made them in years because they are so time consuming to make but maybe I’ll try to fit them in again this year. your blog is too awesome. everything on here sounds delicious. It was really yummy dear.. I liked it very much. It is quite a lengthy process , but at the end when tasted , you feel it is worth it. I tried it for the first time . I am glad I tried it, the same evening my friends came home and they too liked it and were asking me for the recipe. @TomHolmes1945@Home Bar Reviews, I am so glad that you enjoyed these. They have been a favorite of my family for years. any ideas how to get the chocolate to cut nicely on top? I’d like to offer these for a cookie/candy exchange, so I want them to look nice, not raggedy on the ends. @maggie, They do cut a little better at room temperature, so you might try that. Also using a really big sharp knife usually makes it a little easier. These look absolutely heavenly. I can’t wait to make them! I made these for the holidays and they are wonderful! I used semi-sweet chips instead of milk chocolate just because I like them better, but followed everything else to a “T” and they turned out perfect! I cut them into about 6-7 dozen 3/4-1″ squares so we didn’t have to feel guilty about eating more than one. These are a new favorite for me. Thanks! Thanks for letting me know how much you enjoyed them! I am trying to find out nutritional information for Homemade Snickers bars – do you know where I could find this? I made then for the first time this Christmas and they went over super great! Just a quick note to thank you for this recipe – I pinned it last year and made it, and the family loved it, so I’m making it again tonight. Merry Christmas!